At Hornet, we focus on quality from the very start of a project. Whether you want precision engineering, textile or high-volume disposable items, there’s a minimum quality standard. We aim to achieve the right balance of quality and cost for your specific needs. Precise, detailed specifications are the foundations of good quality control. The more information a factory has, the more easily they can produce exactly what you require. Hornet uses multiple techniques to develop and communicate specifications. Some clients have their own specification documents. We offer a specification template for those who have less expertise in this area. Pictures, photographs and diagrams are an excellent way to overcome language difficulties. We often send samples of completed product to manufacturers as this is even more helpful. The samples might be an exact match to requirements, or differences might be noted. Samples from suppliers in China can highlight quality issues not covered by the original specification. It is quite common for a specification to be revised based on a sample. This is not a failure, just a part of the quality control process. Fixing problems at sample stage prevents a far more serious quality issue later. That’s why sampling is a vital part of the Hornet quality control process. Our project managers work with each client to develop a quality checklist. This is customised and covers all the points which matter for your specific project. 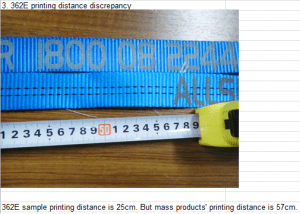 The number of quality control points to check depends on the product, but even for a simple item like a strap, it can be a couple of dozen. Here’s a list of the commonest checklist areas. Size and weight of various parts (the check will also include a measure of tolerance). Stress tests and performance tests. Other points identified in specification or during sampling. Inspection during production is discussed with each client. It may or may not be required depending on the product type, complexity and volume. Hornet conducts pre-shipment inspections for each and every project. Final payment to the supplier is dependent on this quality control point. A member of our team in China generally conducts the inspection so we are sure it is objective. (On occasion we may use trusted external partners due to technical product or factory location.) Detailed reports, including photographs, are provided to the Australian project manager and the client. This extract from a report shows how printing was not properly aligned. Significant quality issues are rare at this late stage, thanks to the checks in our earlier processes. If there is a problem, we work with you to resolve it in the best way for you. You may want product reworked, or we may negotiate a discount. The best evidence for our quality control is the large number of customers who continue to use us for all their sourcing projects.